The U.S. auto industry is in a lobbying fight for its life. The Big Three automakers — General Motors, Ford and Chrysler — have enlisted every stakeholder in their fate as they push Congress and the White House for $25 billion in aid. Autoworkers, parts suppliers, dealers and retirees have all pitched in with calls, letters and personal visits to members of Congress. And the U.S. Chamber of Commerce, the country’s largest business federation, is engaged in a fierce lobbying initiative led by chief lobbyist Bruce Josten and President Tom Donohue. The lobbying has largely focused on educating lawmakers on the national consequences if automakers don’t get help in the short term and debunking the widespread notion that Detroit’s crisis is its own fault, say industry lobbyists. There’s general agreement among the White House and key congressional leaders of both parties that Detroit needs help. But the industry fears that disagreements over where the money should come from will create deadlock. The White House clearly wants to speed up delivery of $25 billion in Energy Department loans originally intended to help automakers retool their factories. House Speaker Nancy Pelosi (Calif.) and other Democrats want to carve out $25 billion in new loans from the $700 billion bailout pot. If Congress ends its autumn lame-duck session without helping the automakers, policymakers are taking a “substantial risk with the economy,” an industry source said. The automakers and their allies warn that failure of the Big Three could cost 3 million to 5 million jobs when the impact on related industries is calculated. “The key for us is getting the money,” not where it comes from, the source said. The impression that the Big Three automakers have been “total laggards” in evolving in order to stay competitive is “totally wrong,” said an industry source. So lobbyists are focused on giving lawmakers evidence that the automakers have adopted cost-competitive structures and are moving toward smaller, fuel-efficient cars, said the source. Advocates for the auto aid say that the current struggles are the result of the massive financial crisis and the credit crunch, along with historically low consumer confidence, which has caused millions in lost sales. The automakers and their allies are also stressing just how much this really is everyone’s problem. GM, the carmaker facing the most immediate threat of bankruptcy, has created a website to detail the widespread economic pain the industry’s collapse would trigger. The site includes a video, which has also been uploaded to YouTube, that includes nearly four minutes of scary-sounding music and frightening facts and statistics, such as an estimate that one out of every 10 jobs in the U.S. relies on the domestic auto industry. “Collapse is imminent if we do nothing,” the video warns. “We can loan $25 billion now … or lose $156 billion later,” the text reads, citing an industry estimate of the cost to local, state and federal governments in lost taxes and unemployment and health care assistance. 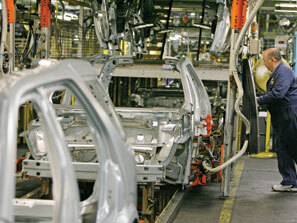 Some analysts, however, say the automakers’ statistics exaggerate the threat to the economy. “Americans are not going to stop driving cars, and if GM, Ford and Chrysler disappear, other companies will expand to soak up their market share, adding jobs in the process,” David Yermack, a professor of finance at New York University’s Stern School of Business, wrote in an opinion piece in The Wall Street Journal. The UAW plans to hold rallies in auto communities around the country, and its website has a plea for individual workers to call or e-mail their representatives. “The auto industry needs help in Congress right away — and if we don’t get it, the jobs and benefits of hundreds of thousands of our active and retired members and millions of other Americans are at risk,” the UAW site warns its members. Chrysler has flown some of its dealers to Washington to make direct appeals. Other dealers have paid their own way, said Bailey Wood, director of legislative affairs and communications for the National Automobile Dealers Association. In all, he estimated, 30 to 50 dealers will visit Capitol Hill by the end of the week. “Dealers can talk about Main Street” in a way corporate executives and their lobbyists can’t, Wood said. “And that’s what many people, and especially many senators, do not realize. This isn’t just assistance for a company. This is talking about jobs on Main Street. This is talking about jobs at dealerships,” which employ, on average, 53 people each, for a total of 1.1 million employees across the country. Industry lobbyists say they’re still hopeful that there will be 60 votes in the Senate to overcome any Republican filibuster against legislation to carve the $25 billion in loans out of the $700 billion bailout package. If not, Democrats will face counterlobbying from environmentalists who don’t want to see the requirements changed on the Energy Department retooling loans, since those were intended to help the automakers meet tougher fuel efficiency standards. If lawmakers go home without acting on the aid to automakers, industry leaders say their “worst-case scenario” could be realized. Suppliers for GM, which recently announced it could go into bankruptcy before the end of the year, are closely watching events on Capitol Hill. If no help is extended, the suppliers could be forced to drastically tighten their payment terms, perhaps from the typical 40-day schedule to five days, analysts said. It also would set off a domino effect throughout the industry, heightening the financial woes of auto suppliers and the remaining two Detroit automakers, Chrysler and Ford, who share many of GM’s suppliers, the industry source said. Lisa Lerer contributed to this story.